It's hard in an election year to get an accurate picture of how your average American is faring. Either unemployment is at a new low, the bank rates are near rock bottom, and a fair wind is blowing for entrepreneurs, or Globalization is killing the market economy, the working class has been deep-sixed, and thanks to Obamacare it's impossible to start a new business. This week I gave up trying to find out which portrait is true. I set my sights lower. I asked a smaller question. "What are the chances of success for Muslims Americans starting a small business?" It seemed like a more manageable assignment, involving 1% to 2% of the population. Nationality: Half of Muslim Americans are native-born. Race & Ethnicity: US Muslims are White, Black, Asian and Arab in roughly equal numbers. Education: about half of Muslim Americans have been to college. As for political leanings, a very recent study from the Institute for Social Policy and Understanding told me that "Most Muslims support a Democrat for president": Clinton, 40%, Sanders, 27%, and (because he says he might deport them) Trump, 4%. As for Practices and Habits, I discovered in a short online film that Muslim Americans do most things other Americans do in comparable numbers, like watch entertainment TV (58%), follow national sports (48%), attend religious services (47%), and give to charity (75%). But how are Muslim Americans doing financially? Muslim American income and education levels generally mirror the mainstream public. 27% own their own businesses. 23% are job creators, employing more than 5 people full-time. 10% of America's 200,000 medical doctors are Muslim. I tried to find out how many U.S. lawyers, school teachers, housewives, nurses, and cab drivers happen to be Muslim, but the few studies that offer such information are too dated. Sometimes the absent data was what stood out. 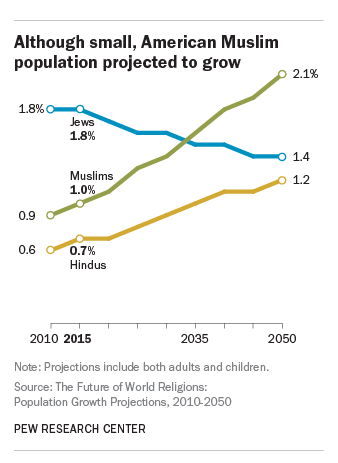 For example, 50% of American Muslims were not born here, a majority from the older generations. Present-day U.S. immigration from Muslim countries remains a mere trickle--not one makes the list of the top 10 sources. On the other hand, those immigrants who do arrive are better integrated into the small business scene than many politicians care to think. Take Minnesota: In the 1990s, turmoil in Somalia sent 50,000 refugees to Minnesota. Near-equatorial Somalis have done well in the snowy north. 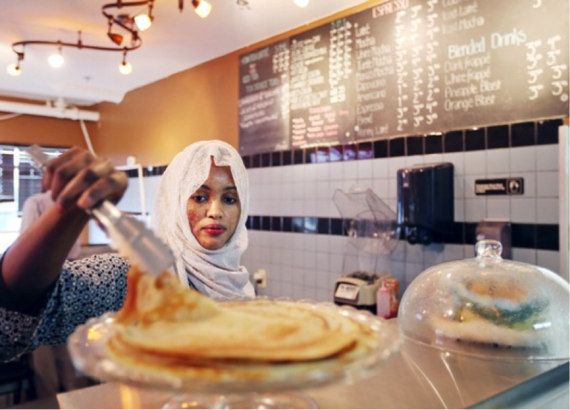 According to the Minneapolis Star Tribune, Muslim women business owners there are driving the growth of one of the largest Somali business centers in America, Karmel Square. Out of 175 clothing stores, hair salons, henna shops, and restaurants, 150 are owned by women. 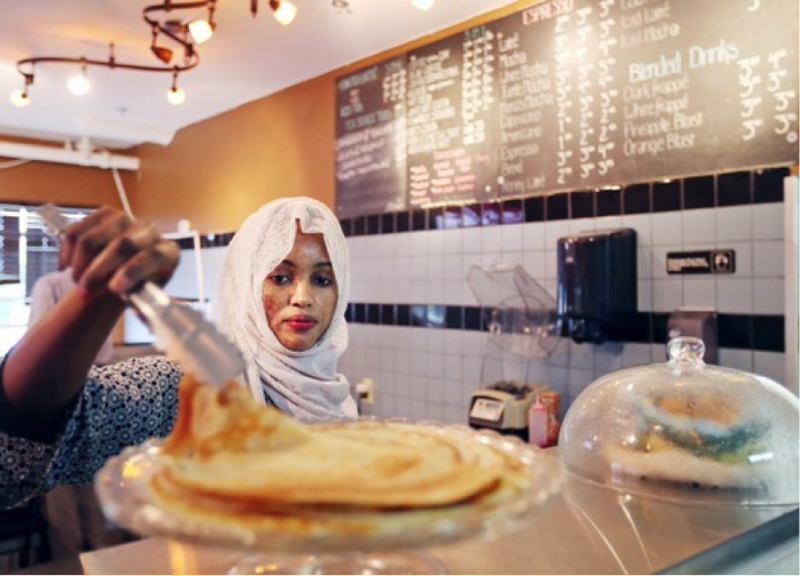 Somali unemployment in Minnesota has dropped from 20% in 2010 to 6% in 2013. At a rival Somali mall across town, in a building with leopards painted on the side, 36 of the 47 business have female owners. It may seem a leap from a Twin Cities market stall to Wall Street, but that's where Adnan Durrani started out almost 30 years ago, a refugee from the trading floor with a Pakistani background and a knack for making and marketing natural foods. From spring water to yogurt, he moved on in 2007 to an idea to do for Halal foods what Hebrew National had done for Kosher products: meet the needs of a specific religious community, one with dietary restrictions and trained taste buds, while appealing to "the concentric ring" of other consumers inclined to favor carefully handled foods. By 2014 his company, Saffron Road, had fifty different products, a close partnership with the Whole Foods chain, and annual sales of around $35 million. 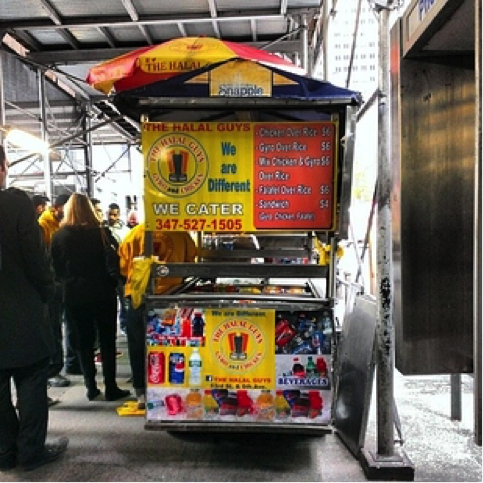 In addition to malls, stalls and wholesale providers to high-end stores like Durrani, the Halal food cart is doing its bit on America's streets to open new avenues of income. Descendant of the 19th-century oyster "bar," the street food stalls of Little Italy, the 1950s wave of Greek souvlaki vendors, the Halal cart is the newcomer to the block. NYC doesn't track cart licenses by ethnicity of food, but doing the numbers it's safe to say that the Big Apple hosts over 1,000 of these Halal meals-on-wheels food stalls. Like Karmel Square in Minneapolis, the cart provides an affordable way to market sought-after culinary delights which, like Saffron Road, attract customers outside the usual market for Muslim Homeland foods. One of them, the Halal Guys of Manhattan, took first place among America's 25 most popular food carts, with almost 50,000 Foursquare check-ins. Starting a new business is never simple, especially for women with meager funds. It got a lot easier here 8 years ago when Grameen Bank opened a U.S. office. Grameen helps women who live in poverty start small businesses to build better lives for their families. It offers small loans, training, and support to fight poverty and transform communities in the USA. Brainchild of social-finance activist Muhammad Yunus, Grameen began in one village in Bangladesh, as Yunus's personal experiment in Micro-Lending. Grameen is a global success story. Its present microfinance model serves 100 million people with $25 billion worth of loans. It is a prime example of how to rethink institutions to better serve people in need. Yunus and Grameen shared the 2006 Nobel Peace Prize for their efforts. In October 2014, he was the keynote speaker at the Islamic Finance Awards held in Dubai. When I met him there he told me, "We want to create Poverty Museums, to remind ourselves what poverty was like." Later I heard him tell a hall full of 3,000 bankers that his goal was to create three zeroes: O poverty, O unemployment, and 0 carbon in the atmosphere. Some in the audience must have listened up: in February, Wells Fargo Company, the conventional banking giant, provided Grameen America with $7 million to support microloans for entrepreneurs. But Grameen doesn't depend on deep pockets. As Yunus put it, "Our model is not trickle down. It's trickle up." Grameen's primary source of capital is the money paid back by honest borrowers, in small increments at low percentage rates. 96% make good on their loans, a rate that is the envy of so-called "normal" lenders. As ambitious politicians vie for control of the Fear Market, trying to persuade voters that American Muslims are a danger they'll protect you from, the small business success of the U.S. Muslim community gives this strategy the lie. It's safe to say in the realm of small business that Muslims aren't the problem. They're part of the solution for the national economy of the richest nation on Earth, which every quarter statistically improves but, especially for the working class, just can't seem to get up off the ground. The youngest faith group in the U.S.